The Centers for Disease Control and Prevention has had to warn Americans about the dangers of dressing up their chickens for the upcoming Halloween festivities. 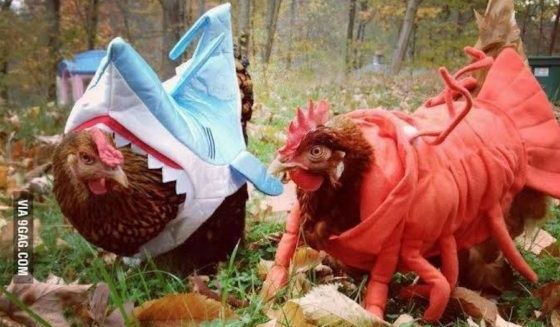 The CDC warns that putting your chickens in a costume could result in a salmonella infection. The agency says handling chickens to put on a costume on them and cuddling the birds can lead to salmonella exposure and an eventual infection. However, for some chicken owners, like Stephanie Morse, the birds are family and their owners enjoy dressing them up each year. “I just like to put a t-shirt on them or a sweater,” Morse said according to KOAA News 5, an NBC affiliate. Salmonella outbreaks have been reported in 29 states, and this time, the strain of bacteria seems to be resistant to drugs making it much more difficult to treat if a person is sickened. Antibiotics resistance is becoming worrisome to health officials too, as many in developed countries overuse antibiotics, or take them for a virus such as the common cold or the flu. As of right now, the CDC is still tracking and investigating a current salmonella outbreak and so far it’s reached 29 states, and infected 92 people. The agency says handling chickens could be a contributing factor to the outbreak. But for chicken owners like Morse, it’s as if she was told to not pet her dog. “Can you ever imagine not being able to dress up your chickens? Or hold them?” she asked reporters. “No. No. I love to hold them, I love to talk to them. Everybody has names,” Morse said. This article was posted in antibiotic resistance, bacterial infection, bird owners, birds, CDC, Centers for Disease Control, chickens, Cold, costumes, cuddling chickens, Family Members, Flu, Halloween, Headline News, illness, meat, Salmonella, sickened, Stephanie Morse and tagged food. Bookmark the permalink. Follow comments with the RSS feed for this post.Comments are closed, but you can leave a trackback: Trackback URL.